Home » Water Kills Houses » Are Your Doors Rotting? In part 4 of the series “Water Kills Houses”, we would like to focus on the Door. Did you ever notice rot around your wood door frame? If so, you most likely have water damage. It’s rare that we replace a door that doesn’t have some type of water damage. Rot around a door is often easily visible. Many times, however, doors can be leaking and there are no visible signs on or around the door itself. The sill of the door may not be properly sealed and water may be flowing around the sill and into the substructure of your house, below the door. Or the trim around a door may have lost its weather-tight seal and is slowly taking in water, rotting the frame or funneling water to the sub-structure of the house. We routinely find rot under or around doors that look fine on the surface. In a few cases that we’ve seen, a leak had been going on long enough that the actual floor joists below the door were partially rotten, undermining the structural integrity of the house itself! There are a couple of easy places to first check if your door is taking in water. First, just look at the bottom corners of the frame and often you’ll see evidence of rot. Even more, take your finger and start pushing around the frame of the door near the bottom and there’s a good chance you’ll find it soft, and you may even be able to poke your finger into it. Unfortunately, if your door has gotten to that point, it’s probably beyond the point of a proper repair. * Secondly, if you have a basement or access to the area below your door, check it out to see if there are signs of water infiltration. Does the section of the basement wall under the door look differently than the rest of the basement walls? Do the floor joists under the door show any signs of moisture? One can often learn a lot by simply checking things out. Check out Part 2 Basement/Foundation series for more information on how to protect your basement from water damage. If your door and door frame seem solid, and there are no visible signs that your door is taking in water, there are a few things that you can do to keep it that water-tight. Inspect the weather stripping around the door and on the sill. Do a visual inspection to see if light is coming through anywhere around the door. Many people are concerned about this due to air infiltration, but those small cracks can also be a place where water gets into the area around your door and runs down to the inside of the sill, rotting the door or worse. Even if there are no signs of light you should still do a visual inspection of the weather stripping. If it looks worn or tattered it’s a good idea to have it replaced. Typically, replacing the weather stripping around the door and on the sill is not overly difficult and costs very little. They can typically be found at most lumber yards, hardware stores, and home centers. It’s a great idea to take a picture of your existing weatherstrip so that you can match it up at the store. If your door or sill are deteriorated to the point that you cannot easily replace the weather stripping, then it’s once again probably time to have the unit replaced. Keep fresh paint and/or sealer on the door. 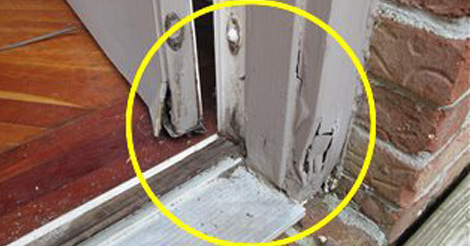 Peeling and chipping paint or stain is an invitation for water to destroy your door. Doors that see a lot of sunshine are particularly susceptible to this problem. The front door on my southern-facing house is fiberglass and has a stained finish. It sees a lot of sun. About every 2 years I need to apply a clear sealer to keep the door in great shape and abut every 4 years we need to add a new coat of paint to the frame and decorative trim around the door. Yes, it’s a pain, but it’s way better than having my house rot out around the door, and I haven’t yet had to replace the unit – saving me thousands! Replace or add new sealant. As I mentioned earlier, water often gets into a door through the base of the door at the edges of the sill or through cracks around the door frame or between the frame and the exterior cladding. Use a quality exterior-grade caulk (Quality means you may have to pay $7/tube rather than $3/tube but it’s worth every extra dollar!) and add a bead of sealant between the sill and the door frame at the bottom. Also, seal up any cracks you may see around the door frame. This simple step could save you hundreds or even thousands of dollars down the road! *If it is time to replace your door, you should strongly consider using a door that has no wood in the frame or the sill. On over 90% of the doors that we replace we use a composite frame and sill. The beauty of this product is that, at least in the door and frame itself, there is nothing that can rot. Beyond that, these composite products hold paint far better than wood so maintenance can go down considerably.